It’s 2012 and I am still giving away money! In part, this is because I fell short of my goal of giving 100 hundreds in 2011. I still had a few hundreds to go when the page turned on the year. What will happen after those are given? I don’t know. I have gotten so much better in terms of my cheapskate-ness, and even managed to keep my 2011 New Year’s resolution, which was to be a better tipper, the entire year. I am a changed woman since starting this whole crazy thing a year and some months ago. I haven’t made any resolutions for this year. I’m not really sure where I’m headed but am feeling an urge to do … something. I’ve gotten a lot of questions about writing a book and maybe 2012 will be the year something happens on that front. There have been a couple of gifts lately. On Friday I stopped by the Dollar Tree on my way home from work. I walked around and around the store, looking at all the people and trying to focus myself. Then I saw someone I know; not a close friend but more than an acquaintance. “Is this your stomping ground?” she asked me. I laughed but didn’t really answer. I thought maybe she knew why I was there, as she’s told me she follows the blog. She had to stop work because she just couldn’t get out of the house every day. I hugged her, urged her to get some counseling, join a grief support group, find her way back to herself and to us. Then I gave her the hundred. “Oh, my god, this just blows me away,” she said, with a sad smile. By the time I got home there was a message on Facebook. On New Year’s Eve morning my watch stopped at 8:18 and I was almost late for work. It really had seemed like time stood still but I knew something was up when it was the same time after my shower as before. I continued to wear the watch for the next couple of days, always surprised that it was still 8:18. There was quite a lot of conversation and camaraderie among people as they waited their turn. “Hi, Reggie, how you doing?” I heard another woman ask. 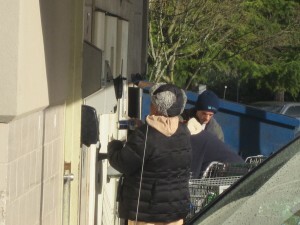 She was smiling at everyone and had a cart piled high with bottles, cans and bulging black plastic bags. Her friendliness and focus captured my attention and I decided to wait a few minutes and see what unfolded. After 15 minutes, she was still feeding items into the machine. 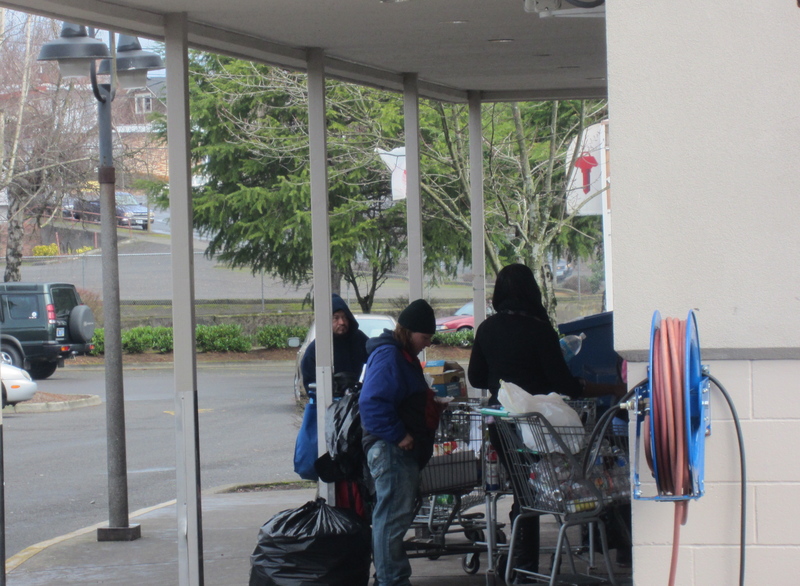 At one point, she emptied a plastic bag full of cans into the cart and I saw a stream of liquid pour out, pooling up on the ground at her feet. Finally she was finished and I saw her collect her tickets and start making her way toward the store. As she got near I stepped out in front of her. “Hi there,” I said. “Hello,” she answered, somewhat cooly. I kept talking, afraid she was going to blow right past me. “I noticed you at the bottle return. That was a big job.” “Yes, it was,” she agreed. I told her I was paying forward a gift and had something to give her. I handed her the hundred and her eyes bulged. “Oh! Thank you!” She gave me a big hug and thanked me again. “What’s your name?” she asked. “I saw you standing over here. I know you. Don’t you do something with a clinic? I just read something about that in the paper last night! God bless you!” she said. Happy New Year, everyone. May we all be givers and receivers of generosity and kindness this year. Happy New Year! Love reading the blogs.